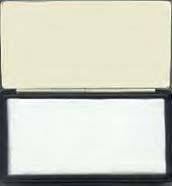 Stamp pads are designed for use with water based stamp inks such as our A720 Etc. They should not be used with most air dry inks as the solvents can have an adverse effect on the plastic and stamp pads (they will dry out very quickly). Heavy Duty 2 sided stamp pad only specially for Fast drying inks such as the AE1250, AE245 etc. Each ink pad surface is 2 1/2" X 4"
Opaque stamp pads are used by industries requiring special purpose opaque inks (thick and viscous or pigmented) for marking nonporous surfaces. 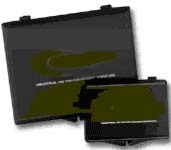 These pads are supplied in pairs so that the two surfaces can be inked, then rubbed together for uniform distribution of the ink. By rubbing the two sides together thicker inks can be applied without clumping. This allows for clear, legible impressions over time. Opaque pads are made of fine cloth covering hard felt attached to a wood base. 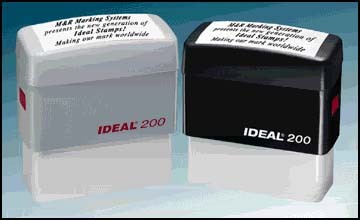 This is the only stamp pad that can be used with solvent/acid based industrial marking inks without destroying the pad. A constant flow of ink from the porous stone helps create high quality, non-smear impressions. 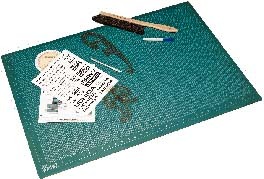 2 3/8" X 3 3/8""
Copyright 1999-2013 Shop For Supplies, Inc. All rights reserved.